The module can consist of a virtually unlimited number of racks and CoolTeg cooling units. We recommend 6 racks (252 - 288U) as a limit where standard data center layout should applied. 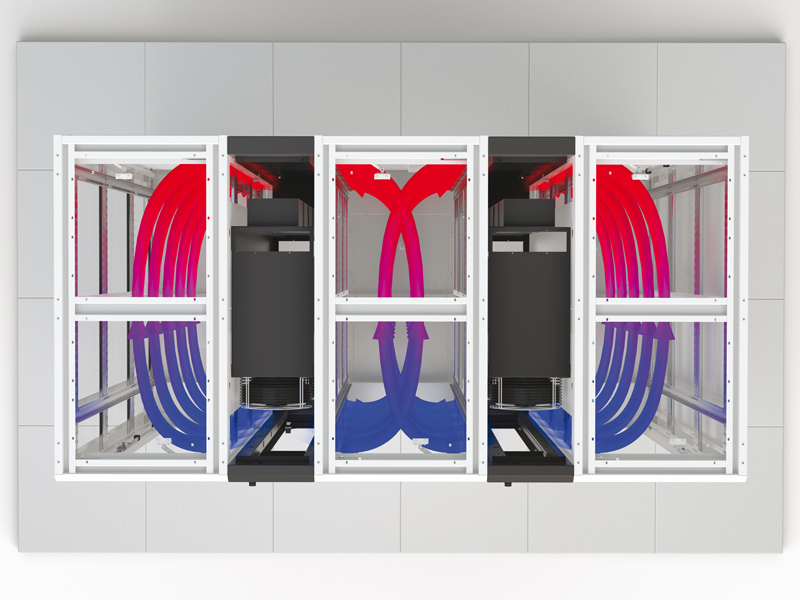 Both cooling unit versions, chilled water (CW) as well as direct expansion (DX), are available to provide the module with needed cooling power up to 34 kW per rack. Cooling units are connected to the coolant piping through the bottom frame. A top connection is available as an option. The dimensions of every cooling units are 300 mm width, 1200 mm depth, 42, 45 or 48U height. All cooling unit versions - chilled water (CW) as well as direct expansion (DX and XC) - are available. Their cooling capacity mainly depends on the air and coolant temperatures. Chilled water units can reach up to 36kW of cooling capacity. Cooling units are connected to the coolant piping through the bottom frame or from the top. The dimensions of every cooling unit are - 300 mm width (XC unit - 400mm), 1200mm depth, 42, 45 or 48U height.